If you like genre shows then boy does Supergirl have an episode for you! “Parasite Lost” feels a bit like an episode where Supergirl throws everything at the wall and hopes at least some of it sticks. That includes opening with an entirely superfluous rooftop garden party sequence because “Parasite Lost” somehow has way too much going on, yet also a lot of time to fill. It’s not a bad episode, per se, but it is a bit of a weird one. It’s part detective story, part family soap opera, part X-Men adventure, part Ghostbusters homage, and maybe even part salute to CBS’ Under The Dome. And if all of that doesn’t give you the sense that something’s just a little bit off with this episode, maybe all the random Dutch angles will! There are two main storylines to “Parasite Lost.” The more successful of the two is the story of rogue DEO agent Raymond Jensen, who has been infected by a parasite who is in fact Parasite, the creature Supergirl battled and apparently didn’t actually kill back in season two. Joining forces with Parasite basically causes Jensen to turn into Rogue from X-Men. He can drain the life force of anyone he touches, including their powers if they have any. So it’s lucky for him that National City apparently has a whole bunch of flying, fire-creating, shapeshifting aliens running around! Jensen has been kind of a nonentity of a character so far, so I was really impressed with Anthony Konechny’s ability to take command of the screen when given a more central role. Parasite’s powerset lends some great visual panache to this episode’s impressively cinematic fight sequences (well, as cinematic as network TV can be), and the fact that Kara can’t physically fight Parasite without strengthening him and weakening herself makes him a really interesting foe for her to take on. 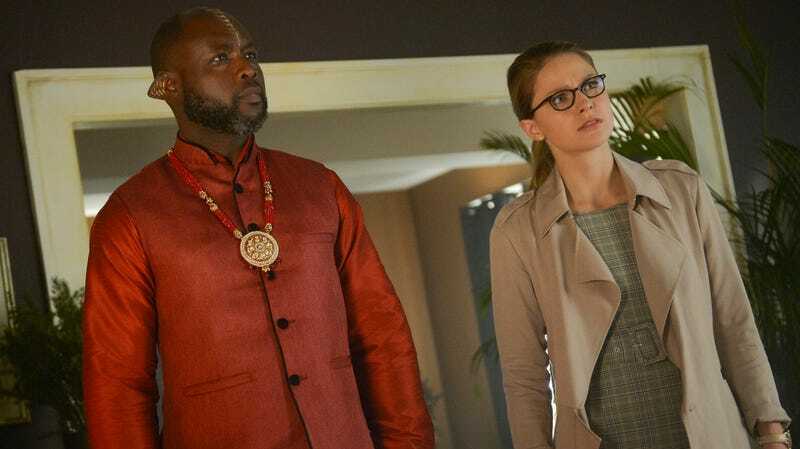 Unfortunately, rather than bulk up those compelling ideas, “Parasite Lost” throws in a whole other storyline about Kara interviewing a reclusive alien healer named Amadei (Adam Levy). As exciting as it is to see Kara get back to the business of being a reporter, the Amadei stuff never feels like more than an underdeveloped tangent that far too conveniently dovetails with the Jensen storyline. Amadei’s magical amulet has the ability to stabilize Jensen’s powers, and he falls into a coma when it’s stolen from him. Kara fears it was her high-profile article that made Amadei a target for the Earth First movement. And maybe it was? Except the person who stole the amulet was Amadei’s ex-girlfriend, who probably already knew it existed? And also Amadei has a secret daughter he’s never met yet somehow knows what she looks like? It’s all way too much to throw into this episode and the central question of “Is Amadei actually a bad guy?” isn’t particularly intriguing when we barely know him. Same goes for his relationship with his estranged daughter. Ostensibly, “Parasite Lost” is about the power of the press and how best to use it during politically divisive times. Does journalism actually have the ability to change minds? Or does it just feed an echochamber? Kara’s Amadei interview doesn’t get at the question in a particularly intriguing way, but James’ storyline does a better job broaching the same topic. With Guardian branded a hero of the Earth First movement, James and Lena engage in a well-trod debate about whether it’s best to actively battle online trolls or just ignore them. But they both get a wake-up call when they realize that the groups they’ve been dismissing as fringe elements—including Ben Lockwood’s online “People’s Verita” platform—are far more mainstream than the imagined. A fellow attendee at the National City Media Summit even refers to Ben as a “centrist,” which is a terrifying example of how quickly political spectrums can shift. James ultimately decides to engage with the Earth First movement in order to try to understand their perspective, although I’m a little unclear if his plan is to hear them out in good faith or to act as a kind of double agent to try to change their minds. Either way, between that and Kara’s decision to write an ongoing column profiling the daily lives of National City’s aliens, I’m glad this season is really committing to CatCo as a major location and journalism as a major focus. Elsewhere, Alex negotiates her power dynamic with Colonel Haley, who at first seems to be a surprise ally before turning out to be an alien-hater with a deep commitment to militaristic order. After years of exploring Alex in relation to her mentor/father figure J’onn, placing her up against a slightly more antagonistic force is a really smart way to bring out new dimensions of her character. The best scene in “Parasite Lost” comes when proton-pack-wearing Alex defies Haley’s orders to take down Jensen and instead appeals to his innate goodness with a very empathetic, Kara-like speech. It’s perhaps not something shoot-first-ask-questions-later Alex would do in a normal situation. But with Haley basically yelling, “Nuke ‘em. Let’s nuke the bastards,” in her ear (about civilians no less! ), it makes sense that Alex might be inspired to rethink her approach. For his part, J’onn has decided that in addition to taking over Fiona’s alien support group, he should obviously become a fedora-wearing private detective for National City’s alien population, who don’t feel comfortable going to the prejudiced police. I like to imagine this storyline came about because David Harewood went to the writers room and asked if he could start wearing a fedora onset. (The whole thing is giving me some serious “Captain Picard as Detective Dixon Hill” vibes, which can only be a good thing.) Like Alex’s storyline, it’s nice to see J’onn explored in a brand new context. He’s using the same investigative skills we’ve seen him use for the past three seasons, but this time around he doesn’t have a massive government agency backing him up. That means he has to be a little scrappier about his methods. All in all, “Parasite Lost” is a bit of a strange episode. It has some strong thematic material, but also some weird plot choices as well. The Amadei stuff is clunky, but it’s not enough to drag the whole episode down. It’s just enough to tilt it into a dramatic Dutch angle. Kara’s seems shocked to discover so many old Amadei interviews when she searches for them, but hadn’t she done any research on him before she interviewed him herself? 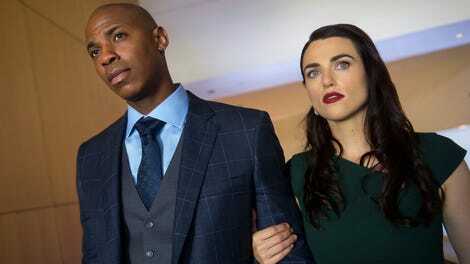 Halfway through the episode, Kara admits she was wrong to optimistically believe in Amadei while Alex notes she was wrong to cynically distrust Colonel Haley. In the end, it turns out both of their initial instincts were actually correct! The image of the drained husk bodies Parasite leaves behind were really, really disturbing. I loved the setup of Kara having just two minutes to evacuate all the civilians from the dome and I’m disappointed the episode just kind of dropped it. Sam Witwer continues to be a standout performer this season and the final scene of him switching from rage to charm after answering James’ phonecall was absolutely chilling. Am I seeing things or did Jensen explode into a ball of purple light and then in the next scene Alex asked to talk to him in his cell?